Nice central location with nice adjoining restaurant. Very dog friendly too!! Beautiful renovated rooms that are very comfortable. The service is top notch. One of my favorite hotels in New York. We had a very nice four-night stay. The room was comfortable, clean and quiet. Hotel staff very helpful and friendly. I'd stay here again! Very convenient location. Lovely and spacious room. I've never been to a hotel where the door to the bathroom is smoked glass. One person goes to get ready, the other person is awoken by the light from the bathroom. Terrible design. The bathroom is very small. The staff is pleasant but cold. Great service all around, other than check-in, when room wasn't ready on time. I know its easy to focus on the negative but the bathroom was unusually small for a luxury hotel. Otherwise, everything as great - location, facilities, cleanliness, service and staff was among the best I have experienced. Visited this hotel during new years eve & it was a pleasurable stay. From the staff friendliness, the fantastic room, perfect location away from the large crowds, and reasonable price, I will definitely recommend to friends/ family. The Loews is conveniently located in midtown, close to many good restaurants, and nearby many businesses. The room was larger than expected, the bed was quite comfortable, and the bar/lounge served some really good food. Very nice hotel with very helpful staff. Room was so good. Not a pokey, tiny room with no room to move. Very spacious and well appointed. Would recommend to others. The first room assigned was not up to standars the mini bar was broken and unable to be fixed. Later after complaints the assistant manager change me to another room. I think the hotel needs some cosmetic face lift to the rooms. The Regency is a classic. The location and style are great for a relaxing weekend. My son and I stayed only one night but for what little time we stayed it was great. The staff were professional, helpful and very nice to my son. Without asking, they brought up a bed for my son even though we had a king. We were able to check in early, which was very helpful. This particular trip we brought our two girls, ages 9 and 12. The suite we stayed in was just right for the entire family. Rooms were large enough and very clean. Nice location and very friendly staff. We will stay here on future visits. 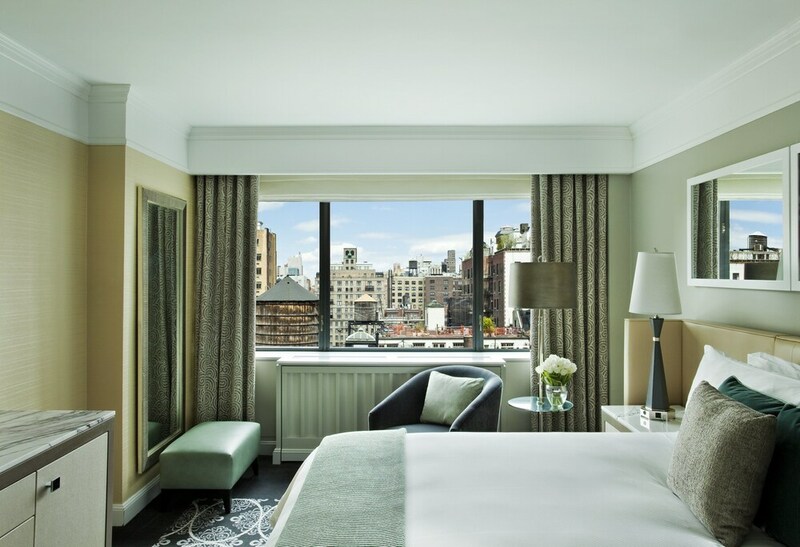 Located in Upper East Side, Loews Regency New York Hotel is adjacent to Madison Avenue and within a 5-minute walk of other popular sights like Central Park. This 379-room, 5-star hotel has 2 restaurants along with conveniences like a full-service spa and free in-room WiFi. Enjoy dining at one of 2 onsite restaurants including Sant Ambroeus, which specializes in American cuisine. Savor a meal from the comfort of your room with 24-hour room service, or get a quick energy boost at the coffee shop/café. Start each morning with full breakfast, available for a fee from 7 AM to 11 AM. A 47-inch TV comes with pay movies, and guests can stay connected with free WiFi and wired Internet. Pillowtop beds sport Frette Italian sheets and the bathroom offers a hair dryer and designer toiletries. Other standard amenities include an iPod dock, a minibar, and a coffee maker. Guests staying at Loews Regency New York Hotel enjoy access to a full-service spa, a fitness center, and a steam room. Valet parking is available for USD 90 per night, and there's also limo/town car service. Multilingual staff at the 24-hour front desk can assist with concierge services, securing valuables, and dry cleaning/laundry. Other amenities at this luxury hotel include free WiFi in public areas, a 24-hour business center, and coffee/tea in a common area. Thank you for your feedback. We're looking forward in seeing you in the near future. Thank you for your feedback. Glad to hear we're your favorite hotel. We're looking forward in seeing you soon. Dear Chad, Thank you for your feedback. We sincerely apologize for the inconvenience you encountered with the bathroom on your last stay. The next time your plans bring you back to New York City, you may want to take advantage of our house cars to take you around Time Square. We look forward in seeing you in the near future. Thank you for your feedback. We have double-bedded accommodations that have a Parve Ave view including suites. We're looking forward in seeing you in the near future with your family. Thank you for feedback. We're delighted you enjoyed your stay with us. Dear friend, Thank you for taking the time to give us your feedback. We're thrilled everything besides the bathroom was to your liking. Sant Ambroeus - Restaurant specializing in American cuisine. The Regency Bar and Grill - Restaurant and bar specializing in American cuisine and serving breakfast, lunch, and dinner. Lobby Lounge - Lobby lounge specializing in American cuisine. Recreation features at Loews Regency New York Hotel include a steam room and a fitness center. The front desk is open 24 hours a day, and checking out is easy with express services. Driving? For a fee, this property offers valet parking, along with extended parking.